Join environmental and social justice activists in a rally in front of Bank of America and march to San Francisco City Hall. Tell the SF Board of Supervisors, SF Mayor, and SF Treasurer to divest its 10+ billion dollar cash flow from Wall Street banks and create a People’s Bank that will operate with principles of equity, social, racial, economic and environmental justice. April 25th is the date of the shareholders’ meeting of Bank of America, one of the main banks that manages San Francisco taxpayer money. 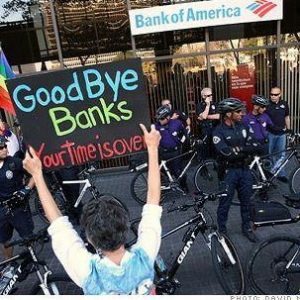 Bank of America currently invests in the Dakota Access Pipeline, fossil fuels, gun manufacturers, private prisons, the military industrial complex, and predatory loans that drive low-income people out of their homes. It is clear that Bank of America is run to make money for wealthy shareholders and not the benefit of those living in San Francisco. The time is now to end our toxic relationship and to finally break up. Tell Bank of America its time is up! Tell City officials to move as quickly as possible to create a peoples bank now!